The consequences of work-related stress on health are worrisome, and by the same token, so is Burnout Syndrome. However, it has been shown that social support can prevent, reduce or even combat individuals’ responses to stress. 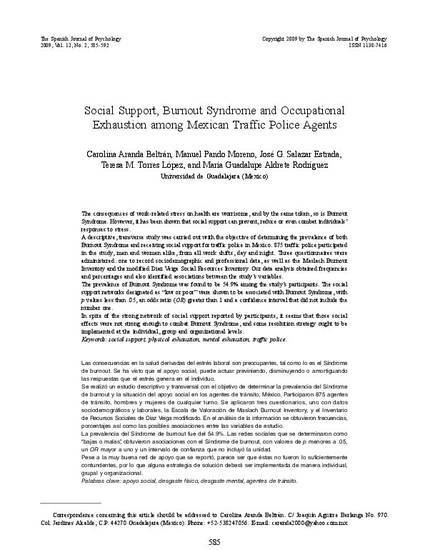 A descriptive, transverse study was carried out with the objective of determining the prevalence of both Burnout Syndrome and receiving social support for traffic police in Mexico. 875 traffic police participated in the study, men and women alike, from all work shifts, day and night. Three questionnaires were administered: one to record sociodemographic and professional data, as well as the Maslach Burnout Inventory and the modified Diaz Veiga Social Resources Inventory. Our data analysis obtained frequencies and percentages and also identified associations between the study’s variables. The prevalence of Burnout Syndrome was found to be 54.9% among the study’s participants. The social support networks designated as “low or poor” were shown to be associated with Burnout Syndrome, with p values less than .05, an odds ratio (OR) greater than 1 and a confidence interval that did not include the number one. In spite of the strong network of social support reported by participants, it seems that those social effects were not strong enough to combat Burnout Syndrome, and some resolution strategy ought to be implemented at the individual, group and organizational levels.